The SXmini box mod is equipped with the latest chipset from YIHI and had an impressive 200W of cloud blowing power. This little jewel of technology pushes the boundaries of what was once thought an electronic cigarette could never ever be. Our first impression of the SXmini was total disbelief, somewhat like the reaction when the iPhone came out. It does everything you want, but also has everything you never even knew you needed. It's hard to describe the excitement of this revolutionary vape mod until you lay eyes on it for yourself and can really appreciate the flawless quality, ease of usability and awesome functionality. 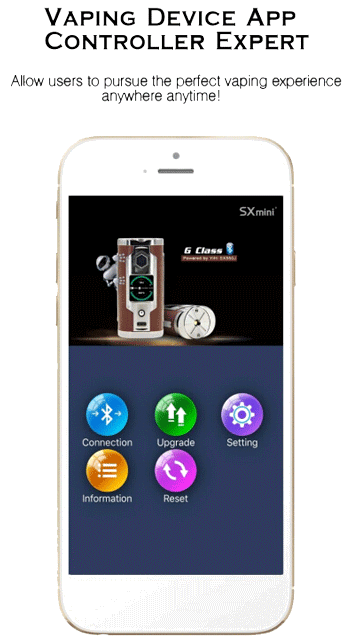 The SXmini G Class is proudly engineered by YiHi and we can see why. They've incorporated all of the latest cutting edge Technology into this Electronic Cigarette and still managed to keep it reasonably priced considering what's inside. We tried scouting out comparable devices to the SXmini and what we found was that there are few other Ecigs this advanced and anything that came did come accross had a retail price tag of 5 to 10% more.